The Middle Belt Forum, MBF, has said that the sole purpose of the killings in the area was to disinherit them of their lands. The group said at present, human lives were cheaper than cattle in the region. The group said this while calling on the Federal Government to declare the marauding Fulani herdsmen as terrorists. They said President Muhammadu Buhari must put in place the necessary security measures to end the ongoing killings in the region. Presenting the forum’s demands after a meeting on Tuesday in Abuja, the MDF President, Bala Takaya, who read the communiqué, stated that the middle belt communities had become endangered under the watch of President Buhari. 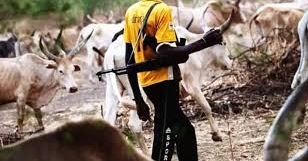 The communiqué read in part, “The most frightening part of it is that government, security and law enforcement agencies merely look the other way rather than chase, track and arrest the herdsmen militia to face prosecution. MBF asked Buhari to wake up to his responsibilities, proscribe the herdsmen militia and rebuild schools, hospitals and places of worship destroyed by the marauders. Takaya also said communities destroyed during attacks by the herdsmen should be granted re-development funds from the ecological fund. He said, “Do we as a people deserve to go through all this? What is our sin? Who will tell Mr. President that he is wrong? Takaya further called for restructuring of the country and an overhaul of the security architecture to reflect true federal character.